Bird in the Bush - A blog about life in Shepherd's Bush: What's going on? You turn your back, or rather gallavant off to Spain for a long weekend, and look what happens; yet another did-they-didn't-they twist in the QPR promotion drama, a red carpet film premiere complete with The Only Way is Essex stars is held around the corner (in Westfield) and Communion Records make more Bushstock announcements. 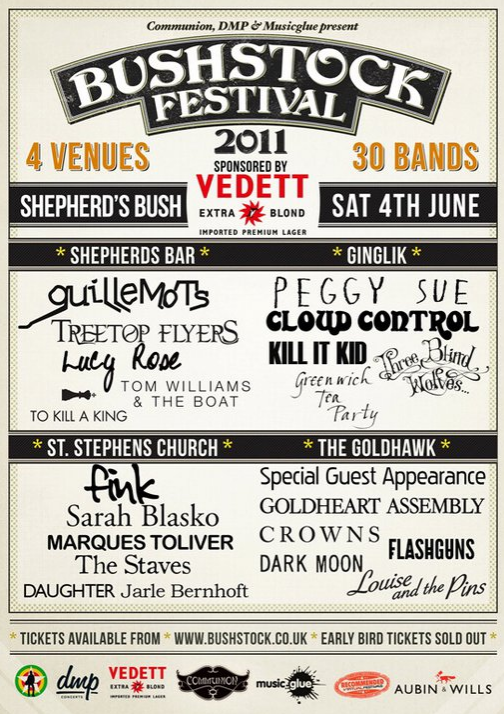 It is about the latter that I am blogging as I am quite surprised that they have not only announced quite a "big" headliner act already, Guillemots, but they have also now confirmed which acts will be performing at which venue. I should add here that not all the performing acts feature on the above poster; there are 30 in total. This is good on one hand because it allows any die-hard fans of artists to pick where to pitch their tent three nights before. On the other hand I find it a little disappointing as it takes away the mystery of the build up wondering where acts will be performing. When it comes to live music, there is nothing better than being at a festival and stumbling across an incredible performance by accident as opposed to fighting the crowds and panicking about which bands are "must-see" months in advance. I suppose the answer to this on the day is to increase the amount of main sponsor Vedett Extra Blond (other lagers are available) that will be on offer and to allow a responsible-ish level of drunk-ness to induce mild amnesia. That said, there is still a "Special Guest Appearance" to be announced, making The Goldhawk a bit more of a venue gamble, and I admittedly know very little about most of the other acts so there is definitely scope to be left amazed and impressed. As part of my run up to Bushstock I will be doing mini reviews of each of the four venues while also bringing you some more information about the acts that will be playing there. 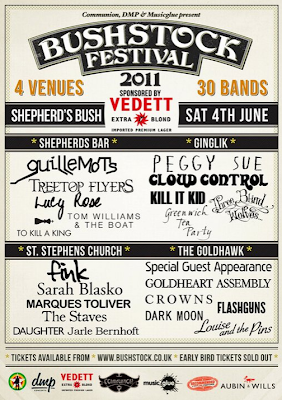 I really do hope that moving from one venue to another is easy and encouraged as this is what will make Bushstock a Shepherd's Bush festival as opposed to four separate gigs. I'll leave you with a song by Shepherds Bar headliners Guillemots', who are rated very highly by many of my most musically aware friends (i.e. unlike me they actually listen to stuff as it's released rather than some months/years/decades later) so I think we should all get jolly excited about their arrival in the Bush on Saturday 4th June.